I am always looking for new and interesting things to eat. Sometimes your palate just needs a break from the routing hum and drum of ordinary foods….And viola, I stumbled across this recipe from Blue Apron, a food delivery service, entitled “Chickpea Burgers with Vadouvan-Roasted Carrots & Feta-Yogurt Sauce“. The very title of the recipe had me intrigued and I am always willing to try something new. The star of this recipe is the vadouvan curry powder. You can find more information at the following link. You can purchase it as a dry powder or make it on your own and use it like a sofrito. The chickpea or chick pea (Cicer arietinum) is a legume of the family Fabaceae, subfamily Faboideae. It is also known as gram, or Bengal gram, garbanzo or garbanzo bean and sometimes known as Egyptian pea. In Northern India, it is known as the ceci, cece or chana or Kabuli Chana. Nutritionally speaking, its seeds are high in protein, and they are more than just a salad garnish and more than hummus. Did you know that chickpeas are one of the earliest cultivated legumes? Nearly 7,500-year-old remains of chickpeas have been found in the Middle East. Imagine that! This is definitely a delicious spin on the veggie burger that combines, onions, shallots, garlic and chickpeas. And the feta -yogurt sauce is the perfect condiment to top this sandwich off. It’s a Keeper in my book…..Happy Eating! Wash and dry the fresh produce. Halve the buns. Drain and rinse the chickpeas; transfer to a bowl and smash with a fork. Peel and mince the garlic. Peel and small dice the onion. Peel the carrots and cut into 3-inch-long sticks. Thinly slice the cucumber into rounds. Quarter and deseed the lemon. In a bowl, combine the Greek yogurt, feta cheese and the juice of 2 lemon wedges; drizzle with olive oil and season with salt and pepper to taste. Place the carrots on a sheet pan. Drizzle with olive oil and season with salt, pepper and half the vadouvan curry powder; toss to coat. Arrange in a single, even layer and roast in the oven, stirring halfway through, 21 to 23 minutes, or until tender and slightly browned. Remove from the oven and toss with the juice of the remaining lemon wedges. Transfer to a serving dish. While the carrots roast, in a large pan (nonstick, if you have one), heat 1 tablespoon of olive oil on medium-high until hot. Add the garlic, onion and remaining vadouvan curry powder. Cook, stirring occasionally, 3 to 5 minutes, or until softened and fragrant. Transfer to the bowl of smashed chickpeas. Wipe out the pan. While the carrots continue to roast and once the aromatics are cool enough to handle, add the chickpea flour and Parmesan cheese to the bowl of smashed chickpeas and cooked aromatics. Season with salt and pepper and mix to thoroughly combine. Using your hands, divide the mixture into 4 equal-sized portions; form into 1-inch-thick patties. In the same pan used to cook the aromatics, heat 1 tablespoon of olive oil on medium-high until hot. Carefully add the chickpea patties. Cook 3 to 4 minutes per side, or until golden brown and cooked through. Remove from heat. While the chickpea patties cook, place the buns on a sheet pan, cut sides up. Toast in the oven 4 to 6 minutes, or until the edges are lightly browned. Transfer to a clean, dry work surface. Divide the cooked chickpea patties between the bottoms of the buns. 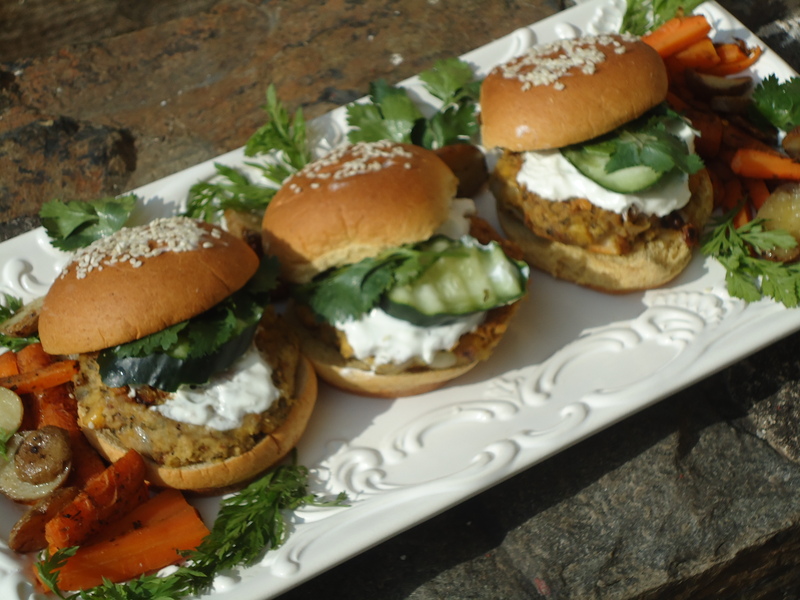 Top with the feta-yogurt sauce, sliced cucumber, arugula and the tops of the buns. Serve with the roasted carrots on the side. Enjoy! You can make your own vadouvan. Click here for the recipe.